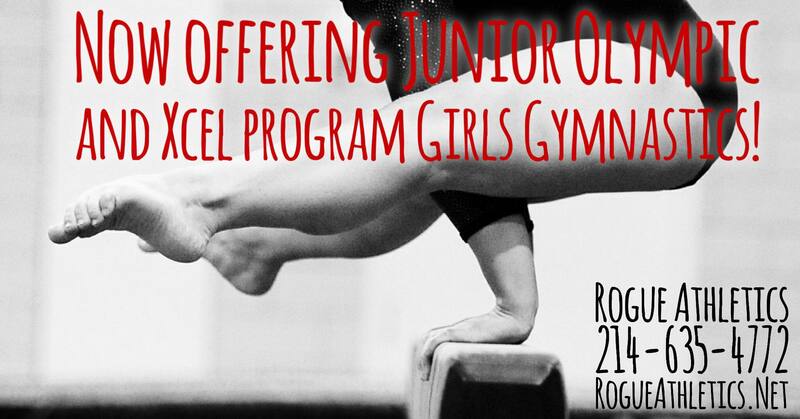 Rogue Athletics offers Recreational girls gymnastics, ages 5 and up. All classes work core events (as seen in the Olympics) as well as training apparatus, including trampolines. Girls will learn proper techniques, gain flexibility, coordination, grace, strength, and discipline. Recreational Classes require NO EXPERIENCE and are open to all varieties of skill levels! Recreational classes begin with Level 1 (Beginner) move up to Level 2 (Intermediate) before being selected or invited to competitive gymnastics training. Rogue Athletics TEAM Program is by invite only! Athletes that are not trained up in Recreational Classes or Developmental Teams will need to be evaluated by our Head Coaches and a level and training schedule will be determined. The Xcel program is a recreational/competitive program created by the governing body of USA Gymnastics. Xcel allows prepared gymnasts to compete at both local and regional competitions. Although this is a competitive program, Xcel is designed specifically to allow gymnasts the freedom to pursue other outside activities apart from gymnastics, and have ample time for school work by minimizing required practice hours at the gym. The JO Training Program is all about athlete development and competitive growth. Athletes are selected, trained, and competed to “Go for the GOLD”. This team is by INVITE ONLY and does require travel and additional training hours. The Junior Olympic program starts with a Developmental Pre-Team, where athletes are conditioned for the difficult skills that go along with competitive gymnastics. Do not hesitate to call the front desk for more details!